Transporteenlinea.net is your one stop Google Map for Colombia. The map includes transport lines, the latest crimes committed and local points of interest. In fact the map has so much data that it comes with three different addresses to provide quick links to the different sections; Transporteenlinea.net, Ciudadenlinea.net and Seguridadenlinea.net. If you select the 'Sitios' option at the top of the map you can find hundreds of points of interest in many different categories, including culture, restaurants and sport. If you select the 'Seguridad' option you can view crimes committed in Bogotá, Medellín, Cali, Barranquilla and Cartagena. The crimes are displayed in a number of different categories, each of which gets it's own type of map marker. 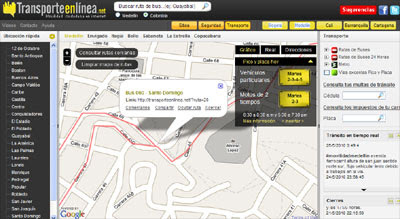 If you select 'Transporte' you can view the bus and metro routes in Medellín. The map sidebar contains quick links to differnet regions in the city. If you click on the 'consult local routes' option and then click on the map you can view all the nearest bus lines to your selected location. Alternatively you can select a bus or metro line form the map sidebar.